In 1916, Karnataka Lingayat Education(K.L.E.) 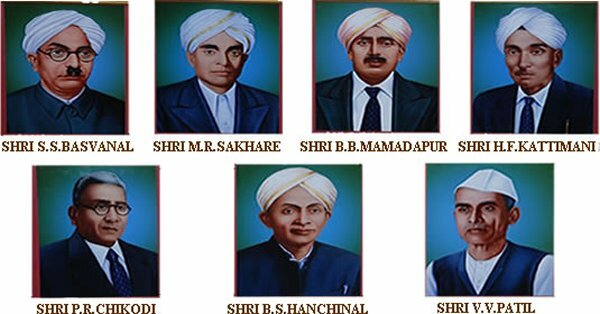 Society was founded by the Seven Founder Life Members, who are also addressed as "Saptarishis"[Seven Saints]. From 1984 onwards, K.L.E. Society started Dental, Education, Nursing, Information Technology, Computer Applications, Hotel Management, Business Management, Tourism, Fashion Designing, Agriculture Colleges and Polytechnics across India. Today under the leadership of Mr. Prabhakar Kore an able and dynamic team leader KLE Society runs 210 institutions. At the center of the Emblem there is a backdrop of an ovular semi-circle below which the words- Truth, Love, Service and Sacrifice are inscribed prominently. Above these words, in a specific spot, two intersecting equilateral triangles (Hexagram) of religious connotation 'Shatsthal' is depicated, inside which a 'Flying Bird' is drawn. At the lower portion, a figure which is sacred to the Lingayats, namely an 'Ishtalinga' held in the palm in a worshipping posture is represented, with a halo around it. Above the semi-circle there is the figure of the resting Sacred Bull-nandi. At the top of the emblem in an artistically carved strip Karnatak Lingayat Education Society, the name of the Society, is written in the Roman alphabet. All these representations are of a marked significance. The Sacred Bull, the vehicle of Lord Shiva is of manifold importance for Hindus, especially South Indians. This is more so for Lingayats, who form a major community in the State of Karnataka. The majority of Lingayats are farmers, and the bullock is the backbone of cultivation. The Lingayats, therefore, treat the Sacred Bull with piety and religious fervor. The Sacred Bull in the Emblem is suggestive of the great and noble service that Lingayats have been rendering in the field of education through the K.L.E Society. The 'Flying Bird' in the center of the Hexagram is the symbol of awakened youth-power committed to taking up any challenge and task for the upliftment of the people, especially the farming community. Thus, the basic objective of educating the educationally disadvantaged people is fulfilled by the services that the K.L.E. Society has been rendering all through these 87 years. The 'Isthtalinga' held in the palm in a worshipping posture is suggestive of the spreading of Veershaiva religion-the religion of Lingayats-and the halo around it indicates the light of knowledge through which Veershaivas have always tried to dispel ignorance and enlighten people with a secular outlook. The words-Truth, Love, Service and Sacrifice speak of the Values that the K.L.E. Society stands for. The word 'Sacrifice' found the real sense in the life and struggle of the 'Founding Fathers' of the Society who actually subordinated their self-interest, their personal name and fame in the cause of education. The K.L.E. Society, which quietly amalgamated, Love, Truth, Service and Sacrifice into one educational society has rendered such an educational service in 87 years that service of this magnitude could not been rendered by others in centuries together. In short, the Sacred Bull is symbolic of Service the 'Flying Bird' of awakened youth power committed and ready to take up nay challenges; the Hexagram of Veershaiva Dharma with its secular outlook in the service of the people; and the 'Istalinga' in a palm and the Halo around it is suggestive of the knowledge to remove ignorance of the people in fulfillment of the Veershaiva philosophy. Therefore, the idea of the Emblem is that, by the union of Dharma, Knowledge, Service and Sacrifice, the Vision of the K.L.E. Society of giving excellent educational service and Sacrifice, the Vision of the K.L.E. Society of giving excellent educational service to the people of all castes, creeds, religions and regions is totally obtained. The society has started Diploma Courses in Engineering in the year 1984 in the Haveri. Our polytechnic has its own beautiful building situated on Pune-Bangalore Road, within 4 kms, from HAVERI Railway Station. In the campus, facilities like sports pavilion with Stadium, Bank, Post Office, Canteen and store are also located.